Now is a good time to plant Jerusalem artichokes; that’s the knobbly kind as opposed to the tall thistly ones that produce a lot of leaf. 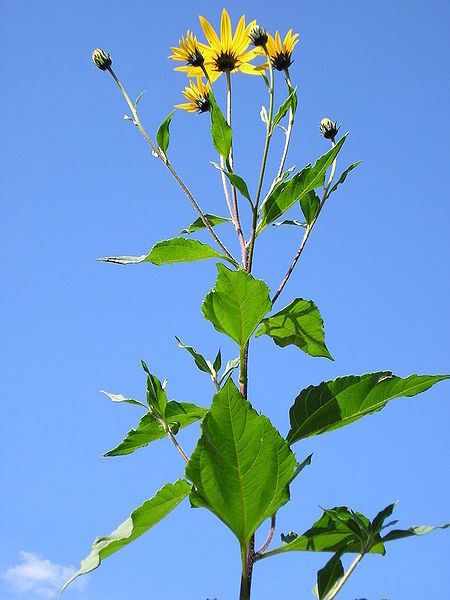 Helianthus tuberosum is the Latin name and it is related to sunflowers, in fact it has a flower the same colour as a sunflower but it is much smaller. You can buy these tubers from the greengrocer or supermarket and then plant them in the ground now. They grow very tall indeed, sometimes reaching about 10ft (3m) and make a really good wind break. (There is a bit of irony there as they also give you wind!). As these plants do grow tall, they can make an effective screen, but may need some support in very exposed and windy sites. A cage made from stout stakes and strong twine will suffice. Plant into well-prepared soil, planting at a depth of 10-15cm (4-6in) with tubers spaced 30cm (12in) apart. 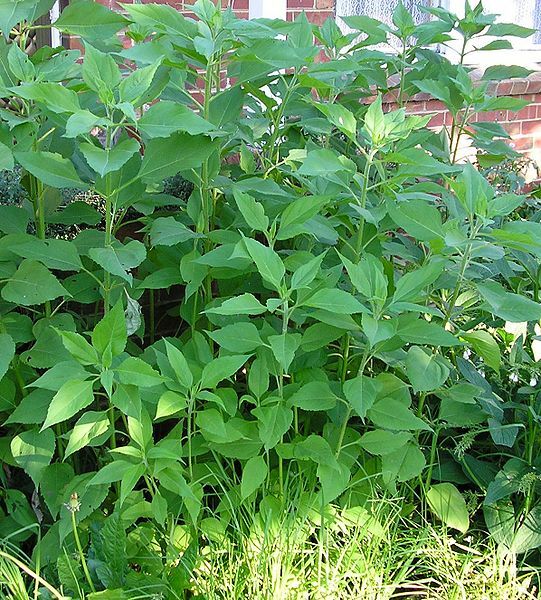 If you are particularly fond of Jerusalem artichokes, space rows 1.5m (5ft) apart. Tubers can also be grown in a large tubs filled with good compost. When stems are around 30cm (12in) tall, draw soil around them to a depth of 30cm 15cm (6in) to help stabilise plants as they grow. 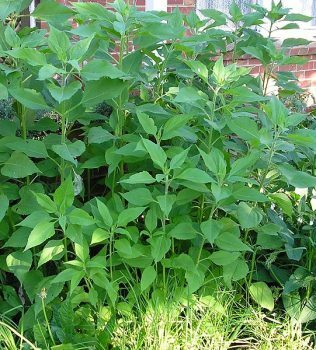 Cut back stems (including flower heads) to around 1.5m (5ft) in midsummer so plants won’t be rocked by the wind, thus avoiding the need for staking. Only water in cases of severe drought. When foliage starts to turn yellow in autumn, prune to leave 8cm (3in) stumps above ground level. Place the prunings over plants to keep the soil warm and aid lifting of tubers in frosty weather.